Tiger Woods has overcome all the odds to regain a once-familiar title: major champion. Woods won the 83rd Masters Tournament in Augusta, Georgia, on Sunday. It's the golfer's fifth time wearing the green jacket, but his first major title in more than a decade. 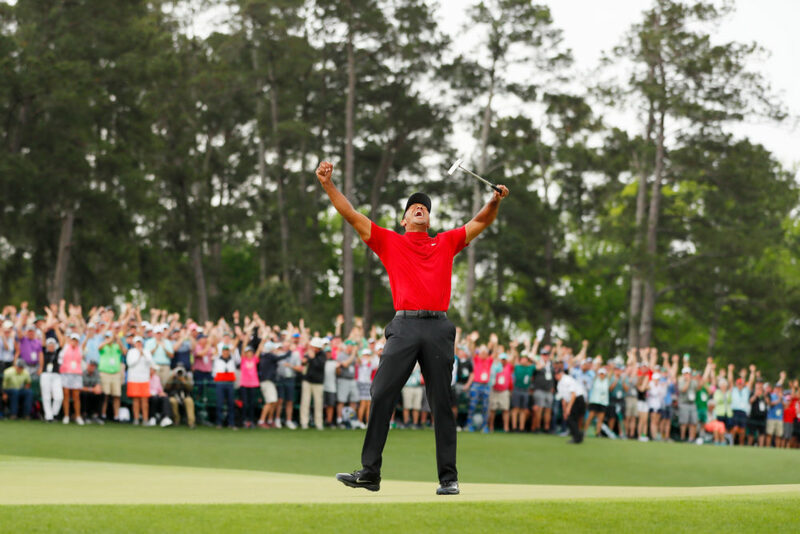 Since his last Masters win in 2005, Woods has endured a series of surgeries and personal scandals that had many pronouncing the end of his career. How did he do it? Jeff Benedict, co-author of the biography "Tiger Woods," says the answer is anything but simple. "He'd reached a point physically where he literally couldn't bend over and pick up soap in the shower or tie his shoes. It's almost hard to exaggerate or overemphasize the steepness of his fall," Benedict tells Here & Now's Lisa Mullins of Woods' lengthy injury history. "He had the physical disabilities, but he also had fairly substantial personal setbacks that were well-publicized. "Golf's a very mental game. And for him to come back both physically and mentally ... I think it's fair to say it could be the greatest comeback in sports," he says. "This is a man who was as down as a human being could be." Woods, one of the most prolific players in golf history, went through a divorce in 2010 that rocked his life off the course. He lost sponsorships after it was reported he had had numerous extramarital affairs — a fall from grace for an athlete who was a beloved figure in the public eye. "One thing he did was he did something that you never see people do who are caught in that situation: He faced the music in a very public way, and he didn't duck anything," Benedict says. "I think ... coming back from something like that doesn't happen overnight — it could take years, or most people don't come back at all. This is a man who was as down as a human being could be." Woods' victory at the Masters puts his major-championship win total at 15. That means he's back within striking distance of the record for the most majors in golf history: 18, currently held by Jack Nicklaus. Golf's next major on the calendar, the PGA Championship, tees off in May at the Black Course in Bethpage State Park. Woods lifted the U.S. Open trophy at Bethpage when the New York course hosted that tournament in 2002. Benedict says Woods is positioned to topple Nicklaus' record "better than anyone who's ever played since Jack." "This is a different Tiger Woods, mentally, than we've probably ever seen. And he's in great, great shape," Benedict says. "I think the sky's the limit in terms of what he could do over the next few years, assuming he stays healthy." Correction: An earlier version of this post incorrectly stated the U.S. Open is golf's next major tournament. In fact, the PGA Championship in May is the next major. We regret the error.